VATICAN CITY (CNS) — Pope Francis warned against “gentrification of the heart” as a consequence of comfortable living, and called on the faithful to “touch the flesh of Christ” by caring for the needy. 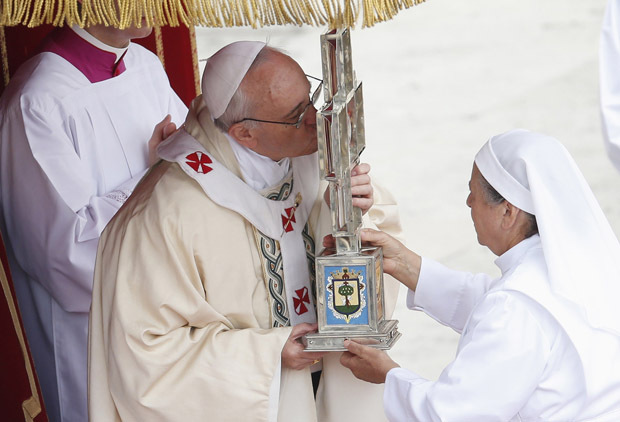 The pope’s words came in a homily during Mass in St. Peter’s Square May 12, when he canonized the first Colombian saint, as well as a Mexican nun and some 800 Italians martyred by Ottoman Turks in the 15th century. 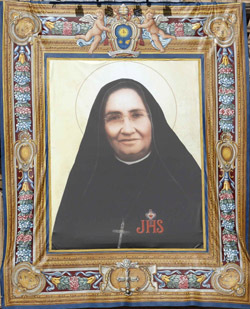 The Mexican saint, known as Mother Lupita, “knelt on the floor of the hospital before the sick, before the abandoned, to serve them with tenderness and compassion,” and in doing so, “touched the flesh of Christ,” he said. 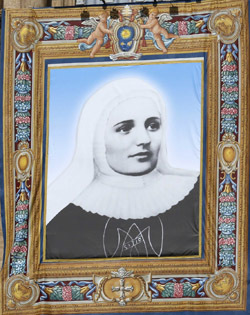 “Mother Laura” founded the Missionary Sisters of Mary Immaculate and St. Catherine of Siena, who today “live and bring the Gospel to the most remote and needy places, as a kind of vanguard of the church,” he said. Pope Francis also paid tribute to the approximately 800 people in Otranto, southern Italy, who in 1480 were decapitated by invading Ottoman forces for refusing to convert to Islam. Before praying the “Regina Coeli” at the end of Mass, Pope Francis called on the Otranto martyrs to “help the beloved Italian people look with hope to the future,” and invoked the intercession of the new Mexican and Colombian saints in bringing peace to their troubled homelands. Colombian and Mexican pilgrims, waving or wearing their countries’ flags, were notable in the crowd filling the square on the sunny Sunday morning.